A Black Forest Décor Exclusive - Upholstered with an elegant diamond pattern woven in soft chenille and tapestry and wrapped with a leather-look fabric, this collection is constructed from kiln dried hardwood and finished with hand-applied pewter trim. Made to order in the USA using imported components. Attached inside back cushions feature encased and shelved inside backs. Available in custom sizes and designs. Please email teresa@blackforestdecor.com or call 800-605-0915, ext. 778 to inquire about custom furniture orders and large bulk order discounts. Additional discounts may be available for large bulk orders. Allow 3 to 6 weeks. 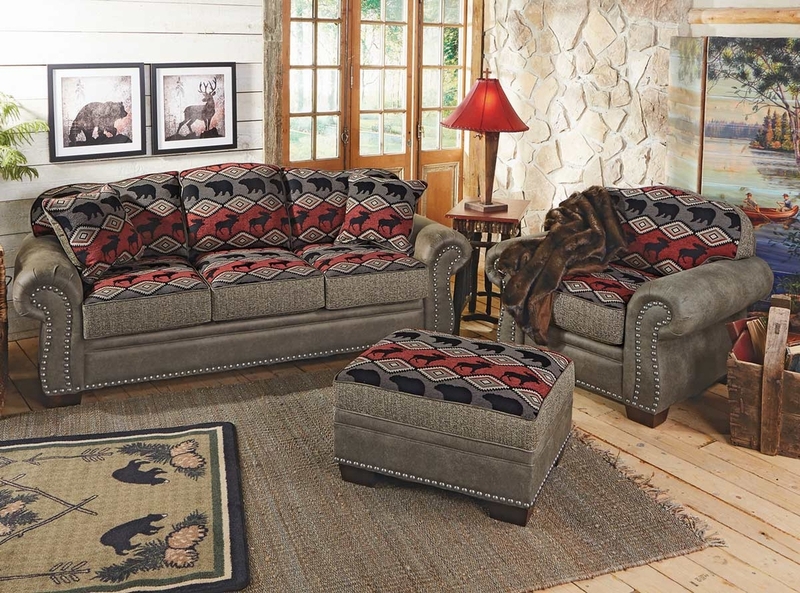 A Black Forest Décor Exclusive - Upholstered with an elegant diamond pattern woven in soft chenille and tapestry and wrapped with a leather-look fabric, this sofa is constructed from kiln dried hardwood and finished with hand-applied pewter trim. Made to order in the USA using imported components. Attached inside back cushions feature encased and shelved inside backs. Available in custom sizes and designs. Please email teresa@blackforestdecor.com or call 800-605-0915, ext. 778 to inquire about custom furniture orders and large bulk order discounts. Additional discounts may be available for large bulk orders. 92"W x 38"D x 41"H; Two 18"W x 18"L pillows included.. Allow 3 to 6 weeks. A Black Forest Décor Exclusive - Upholstered with an elegant diamond pattern woven in soft chenille and tapestry and wrapped with a leather-look fabric, this sofa is constructed from kiln dried hardwood and finished with hand-applied pewter trim. Made to order in the USA using imported components. Attached inside back cushions feature encased and shelved inside backs. Premium mattress included. Available in custom sizes and designs. Please email teresa@blackforestdecor.com or call 800-605-0915, ext. 778 to inquire about custom furniture orders and large bulk order discounts. Additional discounts may be available for large bulk orders. 92"W x 40"D x 41"H; Two 18"W x 18"L pillows included.. Allow 3 to 6 weeks. A Black Forest Décor Exclusive - Upholstered with an elegant diamond pattern woven in soft chenille and tapestry and wrapped with a leather-look fabric, this loveeat is constructed from kiln dried hardwood and finished with hand-applied pewter trim. Made to order in the USA using imported components. Attached inside back cushions feature encased and shelved inside backs. Available in custom sizes and designs. Please email teresa@blackforestdecor.com or call 800-605-0915, ext. 778 to inquire about custom furniture orders and large bulk order discounts. Additional discounts may be available for large bulk orders. 69"W x 38"D x 41"H; Two 18"W x 18"L pillows included.. Allow 3 to 6 weeks. A Black Forest Décor Exclusive - Upholstered with an elegant diamond pattern woven in soft chenille and tapestry and wrapped with a leather-look fabric, this chair is constructed from kiln dried hardwood and finished with hand-applied pewter trim. Made to order in the USA using imported components. Attached inside back cushions feature encased and shelved inside backs. Available in custom sizes and designs. Please email teresa@blackforestdecor.com or call 800-605-0915, ext. 778 to inquire about custom furniture orders and large bulk order discounts. Additional discounts may be available for large bulk orders. 47"W x 38"D x 41"H. Allow 3 to 6 weeks. A Black Forest Décor Exclusive - Upholstered with an elegant diamond pattern woven in soft chenille and tapestry and wrapped with a leather-look fabric, this ottoman is constructed from kiln dried hardwood and finished with hand-applied pewter trim. Made to order in the USA using imported components. Available in custom sizes and designs. Please email teresa@blackforestdecor.com or call 800-605-0915, ext. 778 to inquire about custom furniture orders and large bulk order discounts. Additional discounts may be available for large bulk orders. 31"W x 25"D x 20"H. Allow 3 to 6 weeks.